May | 2010 | Let Teddy Win! 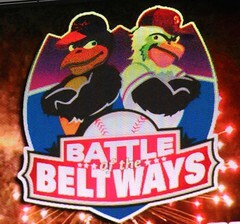 The annual “Battle of the Beltways” between the Washington Nationals and Baltimore Orioles kicked off Friday afternoon as Nationals mascot Screech took on the creatively-named Orioles mascot “The Bird” in a series of challenges including arm wrestling and free-throw shooting at DC’s ESPN Zone. The last time we saw The Bird at Nationals Park, the Orioles mascot was lying in the warning track after Teddy Roosevelt knocked him out cold . The Bird had to wait a year, but tonight sought his revenge, ambushing Teddy in the home stretch of the 4th-inning presidents race. The Bird took on the presidents like tackling dummies, bringing Teddy, Abe, and George to the ground in one swift move; but Jefferson steered clear of the pile-up, and The Bird failed to chase him down. 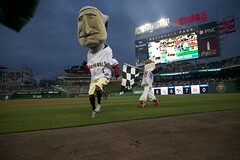 The Nationals toyed with the forces of mojo Thursday night at Nationals Park, trotting out their rarely-used red, white, and blue alternate jerseys for the players, and letting the racing presidents don their traditional period uniforms for the first time this season. 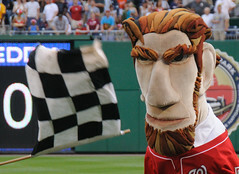 The Nats’ normally solid defense fell apart early, committing 3 errors, and Teddy Roosevelt delivered one of his weakest races of the season. Even after cheating and cutting the outfield corner, the original Rough Rider never challenged front-runner Thomas Jefferson. The Battle of the Beltways starts Friday. Look for the Orioles to bring their creatively-named mascot The Bird to Nationals Park for a third year of presidents race-related hijinks. On a night that featured both a triple play and an inside-the-park home run, oddities seemed to be the order of the day on Wednesday as the Nats returned to Nationals Park to kick off a homestand vs. the New York Mets. 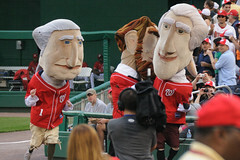 Off the field, TV chef and cookbook author Paula Deen offered to cook Nationals mascot Screech before throwing out the first pitch, and the racing presidents ran a rare relay race; but fans of the presidents know that when it’s time to kick things up a notch in the oddities department, nothing tops an appearance by “That Cat”. The man-sized panther, who last appeared during an exhibition game in April, showed up to once again disrupt the presidents’ rhythm, this time as Abe Lincoln & Teddy Roosevelt formed a relay team vs. George Washington and Thomas Jefferson. In the 4th-inning race, Teddy started out strong and handed the lead to Lincoln, running anchor. Abe looked like a sure winner, but he was ambushed by That Cat, who lept from the stands along the first base line to make a flying tackle. George, running anchor for Tom, high-stepped to an easy victory. Photos by flickr member tbridge. The Washington Nationals return from a 10-day road trip tonight to kick off a five game homestand at Nationals Park vs. the Mets and Orioles. 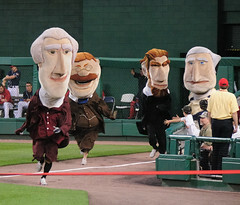 The racing presidents usually get a break while the Nats are on the road, but last week they took to Syracuse, where they held a presidents race during the 5th inning of Stephen Strasburg’s first start for the Syracuse Chiefs. It looked for a time as if Teddy would take the exhibition, but Thomas Jefferson passed him as they raced along the 3rd baseline at Alliance Bank Stadium. For the two games starting tonight vs. the Mets, the Nationals have released a coupon code for Teddy’s friends: Order at Nationals.com using Coupon Code “TEDDY” (all caps) and get up to 35% off tickets in select seating sections. The coupon is valid for online orders only.